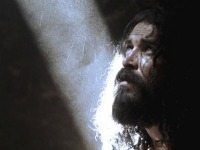 The life of John the Baptist was short, but very meaningful to Jesus Christ. Let's study the life of this great prophet, so we can better understand the life of our Savior. Please read Matthew 3:1-17 before starting GraspingGod.com's free Bible study lessons, #2.05. 1) What did John the Baptist eat? 2) What was John the Baptist's message to the Jews? 3) How did John the Baptist die? Like bulldozers clearing the earth for a new roadway, John the Baptist cleared the religious landscape for a new Messiah, Jesus Christ. John the Baptist was in God’s plan long before He was in his mother's womb. He was prophesied by God’s prophets hundreds of years before being conceived. John is an integral part of God’s plan of redemption, which means he was actually in God’s plan before anyone or anything was created. With the magnificence of God and his plan in mind, let's begin studying the life of John the Baptist. John's father was the priest Zacharias and his mother was Elizabeth. She had been barren for her entire life – and now the two were much too old to even consider children. But the angel Gabriel visited them, describing the approaching birth. Like Abraham's wife, Sarah, Zacharias didn’t believe the angel, so Gabriel cursed him by muting him until after the baby was born. John was miraculously conceived in the womb of a very aged woman. John flipped in the womb of Elizabeth when her relative, Mary, visited with her unborn baby, Jesus. Mary remained with them for several months, as the little cousins grew in their mother's wombs. The year was about 4 B.C. when these two babies would come onto the world stage near Jerusalem. 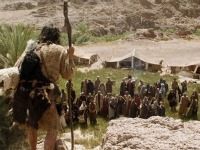 The earthly life of John the Baptist was about to begin. Elizabeth’s baby boy was born and everyone thought they were going to name him Zacharias, or another family name. But Elizabeth demanded they name him John, so they turned to the mute Zacharias. Through writing, he confirmed that the boy would be named John. Immediately, God loosened his tongue allowing him to speak. Zacharias then beautifully proclaimed glory to his God (Luke 1:64-79). The curse God placed on Zacharias obviously brought him to repentance. There is a good lesson for us to learn! John the Baptist grew in stature and spirit. He eventually came to live in the wilderness. John became much like the wild outdoors he lived in. He wore a hairy mantle, which is a cloak made from a camel. He wore a leather belt around his waist. His diet was simple – locusts and wild honey. Jesus later said that John never ate bread or drank wine, like Jesus did himself (Luke 7:33-35). Jesus was calling out the hypocrites who pointed fingers at both John and Jesus. The point is that the life of John the Baptist was extremely simple. 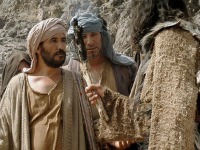 Luke says the word of God came to John in the wilderness (Luke 3:2), which makes John the Baptist a true prophet. A prophet is set apart by God to proclaim his word. 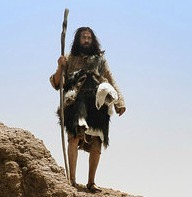 John the Baptist was “on mission” in the desert near Judea. This wilderness is where the Israelites lived when they came out of Egypt. This is a place where the Jews searched for hope, and John was in the midst of it. He was on mission with a message. And the people were coming to him by the thousands, thinking that the prophet Elijah had come again. The life of John the Baptist was lived in order to proclaim that Jesus was coming. The Messiah's sudden arrival would have been too much to handle for the Israelites. The Jews would have rejected Jesus, if not for John the Baptist. John paved the way for Jesus by proclaiming God’s message of hope to his lost nation. Jesus' arrival and message, and even Jesus' life, were all made successful, in part, because of the life of John the Baptist. The content of the message we’re talking about is found in Luke 1:76-77, where Zacharias gives us exactly what John will be proclaiming, “And you child, will be called the prophet of the Highest; For you will go before the face of the Lord to prepare his ways, to give knowledge of salvation to His people, by the remission of their sins.” Once again, the message is “To give knowledge of salvation to His people.” The life of John of Baptist was lived so people could understand how to become saved. To repent means to change your thinking about something, and God was calling these people to return to him. They thought wrong thoughts about him. Their minds had been led astray by the religious leaders of their day. They were all wrong. The life of John the Baptist had a message, and that message was, "Repent!" John added to the message, “Therefore bear fruit in keeping with repentance;...The axe is already laid at the root of the trees; therefore every tree that does not bear good fruit is cut down and thrown into the fire... His winnowing fork is in His hand, and He will thoroughly clear His threshing floor; and He will gather His wheat into the barn, but He will burn up the chaff with unquenchable fire” (Matthew 3:8,10,12). The life of John the Baptist was lived in order to preach the good news of the coming Messiah. Oh, it was needed. The Jews hadn’t heard from God in nearly 400 years. That’s 10 generations of people who had not heard directly from God. They were so out of touch that they thought John might have been the Messiah, but were quickly corrected by him. John was on mission. God sent him to prepare the way for the Messiah. He called for repentance. He challenged them and taught them how to live. And he offered them the baptism of repentance. The life of John the Baptist made the way straight for Jesus. Religion was removed from the picture. People had to individually come to God in repentance and place their faith solely in him. Jesus' baptism will be thoroughly discussed in our next lesson, but, it must be mentioned here in the life of John the Baptist. John's mode of baptism was the first baptism which featured someone other than the baptizee performing the ritual. Previous baptisms, such as Judaism's baptism and Greek religion baptisms, called on the baptizee to perform the rite. People would hear John's strong preaching, confess their sins publicly, and then step into the Jordan River with John to get baptized. It was a baptism of righteousness, which is a turning away from sin towards God. The life of John the Baptist ushered in a new form of baptism. 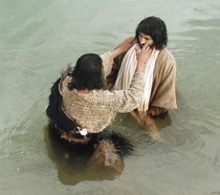 Jesus walked up to John the Baptist at the Jordan River one day and asked to be baptized. John initially refused to administer the rite, because Jesus was the sinless Lamb of God. Jesus' answer though persuaded John to baptize him, "It should be done, for we must carry out all that God requires" (Matthew 3:15). Jesus wasn't repenting, for he had done nothing wrong. But, the Father wanted Jesus fully identifying himself with humanity (Hebrews 2:17). God let Jesus take no shortcuts on the way to the cross. He is also our supreme example and we are to follow his footsteps (1 Peter 2:21). God confirmed Jesus' baptism verbally, and also by sending his powerful Holy Spirit in the form of a dove. Thrown into prison by King Herod, out of which he would never emerge, John was still unclear about Jesus being the Messiah. Many unexpected events had taken place: John was caught in prison, Jesus was encountering unbelievers, and many rumors had begun spreading. Luke 7:18-23 reports that John called for some of his disciples to ask Jesus if he was the Messiah, or if they needed to look for someone else. In other words, Jesus said, “Yes, John, my bold and faithful friend, be in peace, and know that I am the Messiah.” Unfortunately, the life of John the Baptist was nearing a terrible end. The testimony about Jesus killed John the Baptist. Let me explain. Please read (Luke 7:14-29). Ironically, King Herod Antipas loved listening to John preach. Even when Herod was pinpointed for having an affair with his relative, he feared John and would never have harmed him. Herod admired the great preaching style and delivery, for which John was noted. King Herod also struggled with the guilt of his affair because of John's preaching. The relative happened to be Herodias, the wife of Herod's brother, Philip. Herod stole her away from him. John condemned the very public affair. Herod was personally forced to imprison John because of the public nature of the scrutiny. Unfortunately, the out-roar caused by the preaching was too strong and convicting for his wife, Herodias. She schemed to bring the life of John the Baptist to an end. Herod was entertaining friends for his birthday celebration and Herodias sent out her daughter, Salome to dance for the men. The men and Herod were so pleased and grateful, that Herod told the girl she could ask for anything, that is, up to half his kingdom. The unsuspecting girl retreated to consult with Herodias. The girl demanded that Herod kill John the Baptist by beheading him. Herod detested the request, but in order to save face, he called for his executioner. Oaths were considered sacred at that point in Roman history. So Herod fulfilled the morbid request and had John the Baptist's head delivered to Herodias on a platter. Much like what would happen to Jesus a couple years hence, the life of John the Baptist ended in a very inglorious manner. The hatred for truth can be incredibly brutal to the messenger of God's word. The martyrdom of John the Baptist is recorded as the first direct death, because of the earthly life and message of Jesus Christ. I believe John the Baptist to be the first true Christian martyr, but many believe Stephen to be the first. No matter, John the Baptist, like the prophets before him, met an untimely death at the hands of those who hate God. One Bible commentator wondered what kept John the Baptist so humble. He surmised that John had a keen awareness of God’s sovereignty; he fully understood his own unworthiness, and he grasped the preeminence of Christ in the world. In Luke 7:26-28, Jesus said of him, “But what did you go out and see? A prophet? Yes, I say to you, and one who is more than a prophet... I say to you, among those born of women there is no greater than John; yet he who is least in the kingdom of God is greater than he.” That is great praise from Jesus for the life of John the Baptist. Both John and Jesus had a core message: Repent and believe in God through Jesus Christ. Repentance means that you agree with what the Bible says about God and about you. Belief means that you trust in Jesus Christ alone for salvation and eternal life. Repent and believe. That is YOUR calling, too. Your eternal life rests on your ability to repent and believe. Repenting results from learning the truths about God. You should read and believe the Bible, which is how God speaks to us. Let me help in your journey to grasp God with your mind AND your heart. I'm able and willing to help you understand the Bible. We can learn and grow together! Finally, to be God’s man or woman, one has to be called and anointed. The life of John the Baptist in the unfolding plan of redemption was to make a path for Jesus Christ. What is your role in God's plan? You will discover your purpose in life while learning Jesus' words, found only in the Bible. 1) John's message of repentance and belief is directed at all people everywhere. What have you done with the command? 2) What was John the Baptist's baptism of righteousness? How is it different from today's Christian baptism? 3) What is the importance of Jesus' baptism? After sharing this Bible study lesson on Facebook or Twitter below download your FREE printable Bible Study Lessons (pdf version): Life Of John The Baptist, Lesson 2.05. Please Donate to GG.com. Thanks! 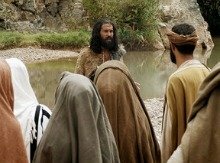 Special Note: I am grateful to my wonderfully talented friends at Big Book Media and Free Bible Images for the use of their pictures in Life of John the Baptist Bible study lesson.